I know, I know..how could I be #SpoiledLatina's assistant and not have known the wonders of MAC Cosmetics? I bet some of y'all don't even believe this. But, in my defense, I had fallen in love with Smashbox and TooFaced and thought I was good. So, what prompted me to stroll into my local MAC? Well! Being that I fell in love with Smashbox and TooFaced in HIGH SCHOOL and I am graduating from COLLEGE next year, I thought it might be time to make more grown up decisions. And, I'll just add in, that this decision went a million times better than my Brazilian disaster (more on that later). To be completely honest, I was terrified of walking into MAC. It is kind of intimidating for someone who doesn't consider themselves a make-up junkie. 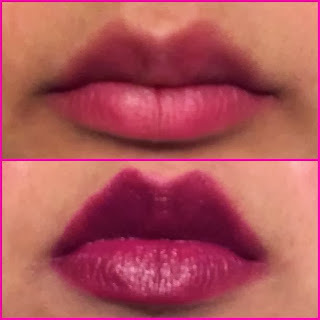 So I did some research first (you know me) and decided that I would be looking for a berry shade. I didn't go in with an exact shade that I wanted, because I wanted to actually get the MAC experience with their trained artists. At the store I had a wonderful woman who approached me immediately (I love that!). After finding out what shade I was looking for, she didn't immediately start shoving all of her lipstick knowledge down my throat or throwing open tubes of lipstick at me like a dart board. I was so impressed! Instead, she started asking me questions about what I wanted the shade for, and what kind of work I did (easy, I'm #Spoiled), among other things. Then she allowed me to pick the shades that caught my eye, none of which worked for me (lol). Regardless, she was helpful and let me test them all out. Right when I was losing hope she suggested two shades of lipstick that showed me love like I have never experienced before. These shades stole my heart today. They were out of Zen Rose, but believe me, I am in Houston today and I am coming for her. But there was no way I was going to leave without Rebel. Here is my natural lip and here is my Rebel lip! I love it! I am a true MAC believer now. My shopping trip was a true experience and my product is amazing. I will be back soon to add my sprouting collection of MAC lipsticks. #SpoiledOnes, tell me your favorite lipstick!